Do bulls really charge at the color red? Are bulls trained before the fight, is bullfighting anything else but a cruel and anachronistic tradition in decline? 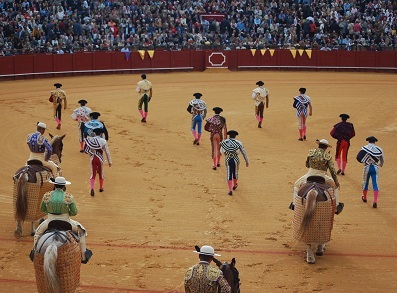 Aficionados International is an organization dedicated to educating the English reading public about the performance art that is the “Corrida de Toros”. We also work with English speaking journalists and connect them to the bullfighting industry in order to achieve a more balanced coverage in the media. What is Bullfighting? What happens in a Bullfight? What is the History of Bullfighting? Does the bull really charge at the color red? Is it true that Bulls are drugged before the fight? Does the Bull ever win? There are many myths about bullfighting out there, we aim to clear up some of the most common ones. Where and how to watch a bullfight, books & movies about bullfighting and information on international bullfighting clubs. What actually happens in a Bullfight? What are the different types of bullfighters? How did Bullfighting develop? Does the really charge at the color red. Are bullfs drugged before they enter the ring? We take on some of the common myths people hold about bullfighting. We connect English speaking journalists to the bullfighting world. Get in touch. Where and when to see a bullfight, how to get tickets, which Matadors to see...We give some tips for a good first experience. Recommended books and movies about bullfighting for people who want to delve deeper. The protagonist of the bullfight...Information on how bulls are raised and selected for the ring.